“Leadership is one of the most observed and least understood phenomena on earth”, wrote the late American historian and political scientist James MacGregor Burns in one of his many studies of the fundamental characteristics of leadership. A concept as old as human history, leadership and its mechanics has long been debated and is a conundrum that continues to this day. Many view leadership as an activity, not an object. Others characterise it as representing engagement between people, rather than an individual gift. Going further, there are those for whom a true understanding of leadership represents nothing less than the holy grail of the corporate world. Debate aside, what is certain is that effective leadership is critical to every organisation, regardless of its size, location, sector or maturity. Identifying the qualities leaders need to be successful is therefore key – especially given the reams of research into the travails of leadership, such as the Center for Creative Leadership study which found that 38 percent of leaders fail during their first 18 months in charge. Compounding the difficulties those earmarked for leadership face is the inadequacy of many organisations’ leadership development programmes. According to Skillsoft, despite the attention companies purportedly pay to the development of their leaders, only 41 percent actually believe that such programmes are effective and only two in five develop leaders in a way that they feel tangibly benefits the business. “Being a leader involves defining a vision and establishing a strategy, motivating or directing others to execute that strategy and delivering results,” says Dr Alexander Stein, founder of Dolus Advisers. “This functional understanding of leadership focuses on whether or to what degrees an individual occupying the leader position possesses certain characteristics and attributes deemed more desirable and effective. “The leader is usually conferred with institutionally unique decision-making authority and influence, but those are elements and prerogatives of the office, not the makings of the person who occupies it,” he adds. Needless to say, there is no such thing as a universally agreed definition of leadership, but there are a number of essential qualities that every leader – potential and established – needs to possess in order to succeed. Augmenting the list of essential leadership qualities is Paul Glatzhofer, director of leadership solutions at Select International, who cites the ability to “lead and influence others, relate and interact with peers, subordinates and superiors, analyse information and make decisions, execute and deliver, and adapt to changes and be innovative”, as the top skills possessed by effective leaders. Once leadership potential has been identified, developed and honed, a leader will quickly be faced with myriad challenges improving his or her organisation’s productivity, turnover, reputation and overall operational efficiency, while, at the same time, avoiding inadvertently taking actions and making decisions that prove ineffective and damaging. A 2018 study by the Center for Creative Leadership found that leaders are consistently facing challenges, such as: (i) developing relevant skills, including time management, prioritisation, strategic thinking and decision making; (ii) inspiring or motivating others to work smarter; (iii) leading a team and team development, such as mentoring and coaching; (iv) managing, mobilising, understanding and leading change, including knowing how to mitigate consequences, overcoming resistance to change and dealing with employees’ reactions to change; and (v) managing internal and external stakeholder relationships. Compounding such challenges is the strong probability that the toughest challenge facing leaders resides within themselves. “Even the most ambitious, talented and skilled leaders have fallibilities and shortcomings,” says Dr Stein. “There is no inoculation against the normal human condition, which is replete with deficits and blind spots. The crucial point is that the flip side of crediting great accomplishment to a single individual is blaming that same individual for being lacklustre or destructive. Although there are some who believe that the topic of leadership has been comprehensively examined from every conceivable angle, leaving very little left to say on the matter, there are, on the contrary, a number of trends and developments set to come to the fore in 2019. According to the Oslo Business Forum, the leadership arena will see: (i) a move toward embracing a work-life blend so that the relationship between a leader’s work life and personal life is reciprocal; (ii) the emergence of upskilling and retraining programmes, from micro-learning sessions to conferences and mentoring; (iii) company culture expand to become a core part of organisations’ business strategies; (iv) greater gender diversity among leadership, with the elevation and retention of females a priority; and (v) leaders increasingly observe the need to not only hold their teams accountable for proper behaviour, but hold themselves accountable as well. The acid test of leadership is the extent to which it drives excellence across the length, breadth and depth of an organisation. Fundamental to this is the approach taken by leaders, with an empathy and engagement style of leadership seen as increasingly persuasive by many. 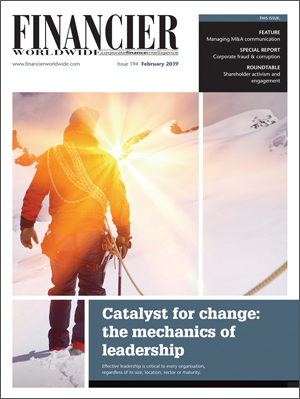 Ultimately, in order to thrive in a dynamic, volatile and fast-changing world, organisations need agile, savvy and effective leadership at all levels – from fledgling manager to senior executive and every role in between – today, tomorrow and beyond.